In today’s rapidly changing world the demand for mathematical skills is increasing. Mathematics helps students develop critical thinking skills that are necessary for everyday life. Additionally, a requirement for most jobs, even at the entry level is the attainment of a passing grade in Mathematics at the Caribbean Secondary Education Certificate (CSEC) level. It is important therefore, that our school education system provides students with the necessary foundation in Mathematics that will ensure their success in examinations and the continued application of Mathematics in the workplace and everyday life. 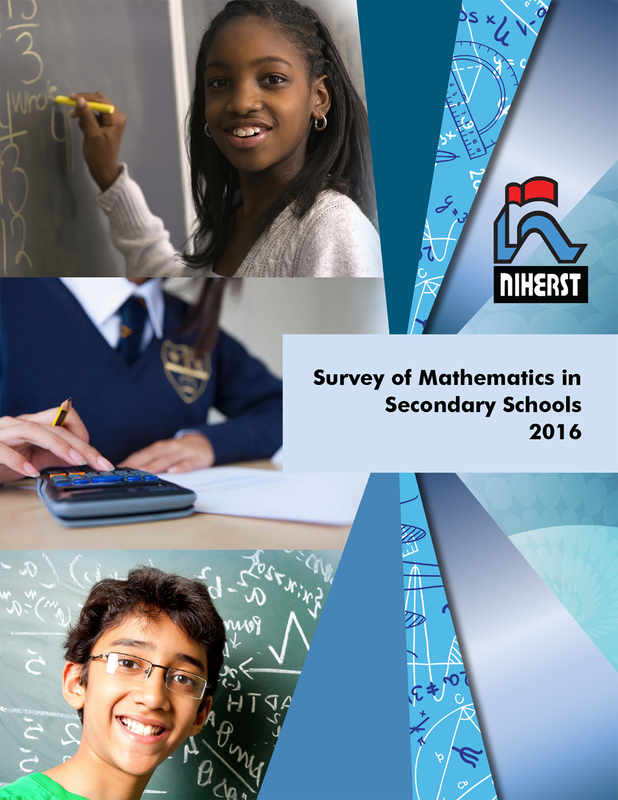 The National Institute of Higher Education, Research, Science and Technology (NIHERST) presents the results of the Survey of Mathematics in Secondary Schools, 2016. This survey was designed to provide empirical data on the teaching of Mathematics in secondary schools and has generated essential data on indicators for comparison with similar regional and international studies. The 2016 survey is a follow-up to a similar study conducted by NIHERST in 2006. The Survey of Mathematics in Secondary Schools, 2016 is a two-part enquiry of Mathematics teachers and of students in forms 1 to 5 in all of the government, government-assisted and private secondary schools in Trinidad and Tobago. The survey provides essential data on the profile of secondary school teachers, their training needs, choice of career and difficulties encountered in teaching Mathematics as well as the adequacy and availability of teaching resources, the use of teaching and evaluation methods and students’ attitudes towards Mathematics and mathematical careers. This publication should serve as a useful resource for decision-makers, curriculum specialists, researchers, teaching personnel and, in general, stakeholders in Mathematics education. Of the total sample of 143 Mathematics teachers, 40% were males while 60% were females, representing a 1:1.5 male to female ratio. 	In terms of age distribution, the largest percentage (48%) of Mathematics teachers was observed in the 30 - 39 age group, followed by approximately a quarter (24%) in the 20 - 29 age category and one-fifth (19%) in the 40 - 49 age group. Overall, the majority (82%) of teachers reported an undergraduate degree as their highest educational qualification and 12% indicated a post-graduate degree. Of the teachers who possessed a university degree, 47% had a degree in Mathematics. A comparison of the results of the survey to a similar study undertaken in 2006 shows a significant increase in the highest level of education achieved by Mathematics teachers. The percentage of graduate teachers increased from 53% in 2006 to 82% in 2016 at the undergraduate level and from 4% in 2006 to 12% in 2016 at the post-graduate level while A levels/CAPE declined from 33% in 2006 to 2% in 2016. A substantial percentage (46%) of the sample of teachers had no professional qualification, while 22% possessed a diploma in education and 12% had a B.Ed. A substantial percentage (48%) of the teachers with a first degree who were engaged in teaching Mathematics were professionally trained as were 76% with a higher degree. Approximately half (49%) of the teachers who obtained professional training, especially those with a diploma in education (69%) and a B.Ed. (65%), specialised in Mathematics. Seventeen percent (17%) of the teachers, mainly teachers with a M.Ed./Ph.D. (88%), obtained professional training in the field of Education. Compared to the study undertaken in 2006, the data show a decrease in the percentage of teachers without professional training from 60% in 2006 to 46% in 2016. The percentage of teachers with a B.Ed. degree increased from 2% in 2006 to 12% in 2016, while teachers with a M.Ed./Ph.D. qualification increased from 2% in 2006 to 6% in 2016. Over a third (35%) of the teachers sampled reported service of 15 years and over. Over a quarter (27%) of the teachers indicated 5 - 9 years of teaching experience and one-fifth in each case reported 0 - 4 (20%) and 10 - 14 (19%) years of service. The majority (73%) of teachers indicated that they were not desirous of changing to another career. Of the teachers who were not desirous of changing career, a substantial proportion (41%) stated that they enjoyed teaching and helping students learn. The main reasons cited by teachers who were willing to change to another career were to earn a higher salary (23%); teaching was too stressful (17%) and; the desire to pursue a dream career (17%). A comparison of the results of the study to the 2006 survey results shows an increase in the percentage of teachers desirous of changing to another career from 19% in 2006 to 24% in 2016. Overall, a larger proportion (41%) of teachers indicated that they attended teaching methods workshops in Mathematics in the last two years compared to attendance at curriculum (36%), assessment (20%) and problem solving (18%) workshops. A significant percentage (85%) of the sample of Mathematics teachers indicated that there was a need for more professional development workshops for the effective teaching of Mathematics. The main topics identified by teachers for future workshops were curriculum (16%), teaching methods (15%), use of technology to teach Mathematics (11%) and classroom management (10%). With regard to assistance required in teaching areas, the data reveal that teachers required the most assistance in using audio visual resources and diagnosis and remediation. A significant percentage (87%) of the teachers used a textbook to teach Mathematics. Of the teachers who used a textbook to teach Mathematics, over three-fifths (62%) used the textbook as a supplementary resource in teaching Mathematics while 35% used it as the primary basis for their lessons. Approximately three-quarters (77%) of the sample of teachers stated that they were very familiar and 20% were familiar with the CSEC Mathematics syllabus. The survey results show that 45% of the teachers reported restricted use of calculators by students in their Mathematics class while 31% had unrestricted use and 24% stated calculators were not permitted. Four-fifths (81%) of the sample of teachers indicated that computers were not available for use in their Mathematics classes by students. Of the schools with computers available for use in Mathematics classes by students, 59% had access to the Internet to use for Mathematics. A comparison of the results of the studies undertaken in 2006 and 2016 shows a decrease in the percentage of teachers who did not use the Internet as a teaching resource from 50% in 2006 to 25% in 2016 while the percentage of teachers who used the Internet a great deal and moderately increased from 2% and 10% in 2006 to 9% and 23% in 2016 respectively. A significant majority (87%) of the teachers reported that their schools had no Mathematics club. A substantial percentage (48%) of the teachers who participated in the survey used manipulatives and teaching aids in teaching Mathematics. The main manipulatives and teaching aids used by teachers in their Mathematics classes were 3-Dimensional shapes, multimedia, geoboards, fraction boards, charts, Internet, Mathematics videos, educational games, algebra tiles and scales. A significant percentage (83%) of the sample of secondary school Mathematics teachers agreed that Mathematics is a hands-on subject while 10% responded negatively and 6% did not respond. The most frequently performed mathematical activity was the practice of computational skills at every lesson (34%) and most lessons (36%). A quarter (24%) of the teachers indicated that the students in their Mathematics class never worked on problems for which there was no immediate obvious method of solution. Approximately two-fifths of the teachers in each case reported that students worked individually with assistance from the teacher (41%) and together as a class with the teacher teaching the whole class (41%) at almost every lessons which indicated a continuation of the traditional method of teaching. Almost all Mathematics teachers surveyed agreed with the statements: 'more than one representation (picture, concrete material, symbol set, etc.) should be used in teaching a Mathematics topic' (96%) and 'an understanding of students is essential for teaching Mathematics' (97%). There was also significant agreement with the statement 'some students have a natural talent for Mathematics and others do not' (82%). The majority (45%) of teachers taught their class Mathematics for five periods weekly while 30% reported six periods of Mathematics per week. Over one-third of the teachers indicated that disruptive students (36%) and student absenteeism (34%) limited how they taught Mathematics a great deal, while 29% assigned a similar rating to high student/teacher ratio. A substantial percentage of teachers reported that threat(s) to personal safety or the safety of students (68%) and parents’ interest in their children's learning and progress (59%) had little or no effect on the teaching of Mathematics. Teachers assigned the most weight to teacher-made tests which received 'a lot' by over a half (56%) of the teachers followed by standardised tests (47%) and responses of students in class (43%). Portfolios and peer assessments to which a half or more of the teachers assigned the weight of 'a little' or 'none' were the least significant methods of assessment. The data reveal a fairly even distribution of students, ranging from 22% in Form 1 to 19% in Form 5. This survey was designed to provide empirical data on the teaching of Mathematics in secondary schools and has generated essential data on indicators for comparison with similar regional and international studies. The 2016 survey is a follow-up to a similar study conducted by NIHERST in 2006.